Logic puzzles | Name-Brand Ketchup. As I mentioned here previously, I used to write logic puzzles for Dell Magazines. Between 2000 and 2005, several dozen of my creations hit the newsstands. And, occasionally, one will still surface as a reprint in a current issue. Since the 1930s generations of mystery readers have relished the slam-bang action-packed rough-and-tumble chronicles of that hard-boiled gumshoe, Spats Hanrahan. Spats is a no-nonsense shamus with a sharp eye, a square jaw, and a soft spot for sob sisters and down-and-out palookas. In a series of potboiler novels (one was “One-Way Ticket to Trouble”), Spats got called into cases when the downtown coppers couldn’t find a different missing valuable (one was a solid bronze Studebaker). In each, he uncovered a different clue that the G-men had missed (one was a fingerprint in a bowl of tapioca pudding) and ended up cracking the case! Can you determine which of Spats’ novels features which missing property, and what clue he discovered to solve each mystery? 2. In “The Milkman Never Brings Cheese” Spats recovered a secret miniaturized radio, shrunk down to the size of a briefcase! 4. In “The Case Of The Frightened Flapper” Spats noticed a poorly-folded road map on the floor of the wrongdoer’s car. Finding one’s name in an unexpectedly pleasant place. I used to write logic puzzles for a couple of different magazines, mostly ones published by Penny Publications. You can find some examples of them here and here. I like to solve them and I felt I had a pretty good knack for writing them too. I haven’t submitted any for ten years now, but from time to time I still find some of my puzzles being reprinted in issues of Dell magazines. Other places, too, as I discovered the other day. 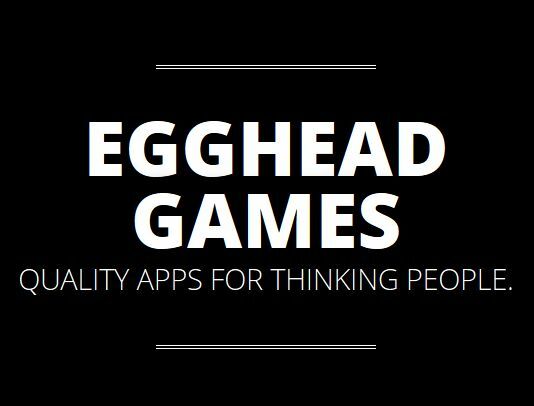 I downloaded a Logic Puzzles app for my smartphone from a provider called Egghead Games. I opened up the selection of puzzles — and there was one of mine, that I’d written about thirteen years ago. One of my favorite ones, too, as it happens. Not an exaggeration to say I was mind blown. My work, my byline, on this handheld screen, on handheld screens all around the world. Pretty cool. Naturally I was ever so cool about it (not): I leaped around the room and showed my coworker Laurie. It was a moment of pure geekery bliss. If you like a nerdy challenge take a spin at one of my puzzles, look for my byline in a Dell magazine, or get the app at Egghead Games. Hope you have as much fun solving them as I do writing them. This one is heretofore unpublished. Take a look, drop me an email if you would like the solution. Linda gets serenaded every weekday morning on her way to work. Her boyfriend William is the morning DJ on popular radio station WYRD-FM (“Wonderfully WYRD”), and each morning he dedicates a special song to his sweetie. Linda’s drive each morning is from 6:15 till 6:45, so William makes sure to play each song (one was “The Lovely Linda” by Paul McCartney) during that time period. 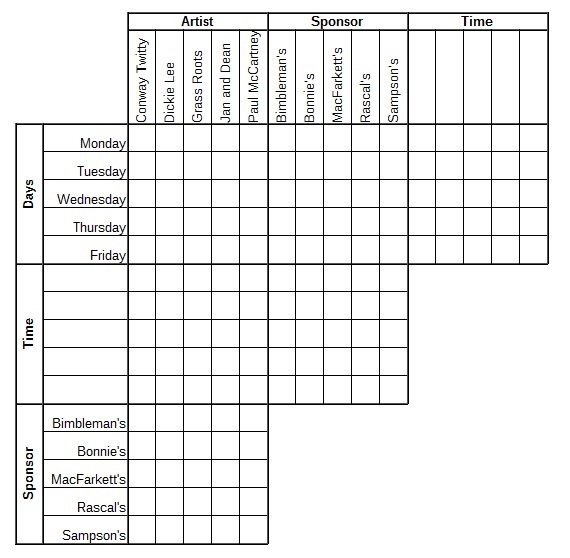 Monday through Friday this week he dedicated a different song to Linda each morning at a different time, immediately followed by a different commercial spot for a local sponsor (one was MacFarkett’s Market). So Linda always arrives at work with a smile on her face, humming her song of the day! Can you determine which song William played for Linda each morning, what time he played it, and what commercial spot followed each song? On three consecutive days William played “Linda On My Mind” by Conway Twitty, the song that preceded a spot for Bonnie’s Beauty Parlor, and the song that played at the latest time. The Thursday dedication played at a later time than “Bella Linda” by the Grass Roots, and earlier than the Wednesday dedication. On three consecutive days Linda heard the song that preceded a spot for Bimbleman’s Bakery, the song that aired at 6:35, and the song by Paul McCartney. The latest song William played was at 6:40. On three consecutive days Linda were treated to the song that aired at 6:15, “I Saw Linda Yesterday” by Dickie Lee, and the song that preceded a spot for Sampson’s Hair Care. Only one song played at a later time than “L-L-L-Linda” by Jan & Dean. The spot for Rascal’s Pub played right after the 6:20 song. The song played at the earliest time aired the day before the one that preceded the spot for Bimbleman’s Bakery. Monday’s song was played ten minutes later than Friday’s song. 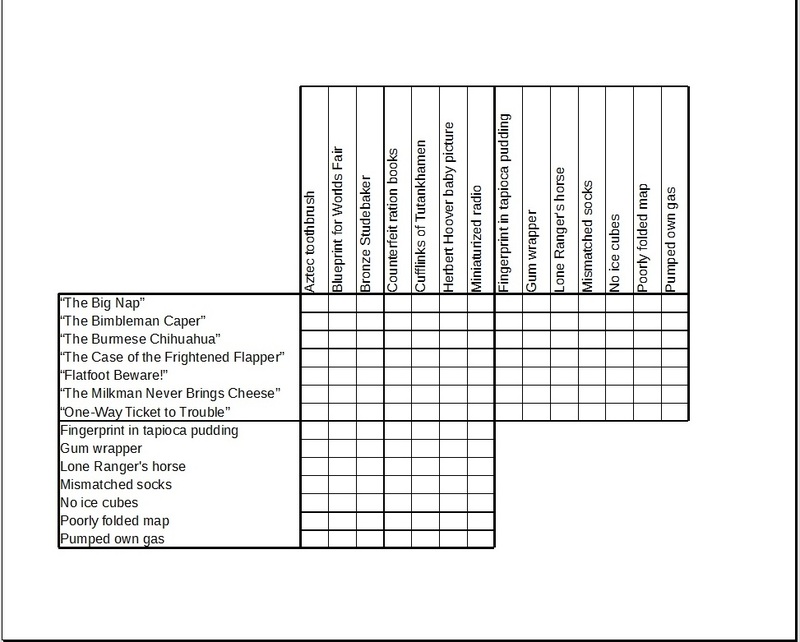 I used to write logic puzzles. From 2001 through 2006 several dozen of my creations were published in “Dell Logic Puzzles” magazine. (I notice now it’s been rechristened “Dell Logic Problems.” Not sure of the significance of the name change.) I really like solving them, and writing them. Haven’t written one for a long time, but will probably do up a few more. I wrote this one back in the summer of 2001. I figure I can post this, I wrote the doggone thing. So try and solve it. Send me a message with your email addy, and I’ll provide the answer. Each and every morning, hundreds of thousands of newspaper readers turn to the column written by everyone’s favorite advice-giver, “Dear Audrey.” Troubled souls far and wide write letters to Audrey asking her sage advice on a wide range of topics. This week, Audrey answered queries from seven readers who each have a different problem (one has a roommate who snores). Real names are never given in Audrey’s column; instead, letter writers are identified by a pen name (one is “Freaked Out in Fargo”). And of course Audrey always provides just the right advice for each reader’s dilemma, capped off with one of her trademark irascible reprimands (one reader was told, “No matter how you slice it, that’s baloney!”). Can you determine which pen name is attached to each problem, and the words of admonishment each reader received with Audrey’s advice? Two readers wrote about distant family weddings (one was invited to such a wedding, and the other was not); they are “Puzzled in Poughkeepsie” and “Embarrassed in Evanston” in some order. Two readers wrote about blind dates (one is constantly being asked out on them, and the other never is); they are “Distressed in Dubuque” and “Uncertain in Utica” in some order. The reader who found a perfumed note on the boss’ desk and the one whose neighbor plays the tympani all night were told to “run to the store and get a life” and to “call a detective and get a clue,” in some order. “Wake up and smell the pancakes!” was Audrey’s admonishment to “Distressed in Dubuque”. “Troubled in Tupelo” wrote about finding a perfumed note on the boss’ desk.